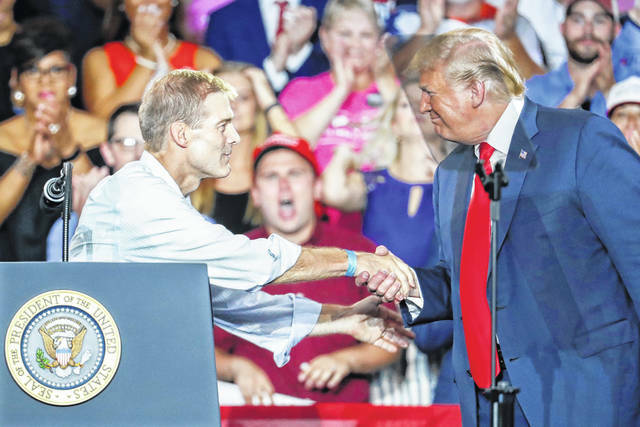 President Donald Trump, right, shakes hands with Rep. Jim Jordan, R-Ohio, left, during a rally, Saturday, Aug. 4, 2018, in Lewis Center, Ohio. LEWIS CENTER, Ohio (AP) — Embracing his breakneck return to campaign politics, President Donald Trump on Saturday argued that Republicans needed to control Congress by casting the midterms as a referendum on himself. Though boisterous and bellicose, Trump steered clear of the trouble he stirred up the night before when he blasted one of Ohio’s favorite sons, LeBron James. In a late-night tweet, Trump derided the intelligence of one of the nation’s most prominent African-American men. The attack on James, who has been critical of Trump, came just as the NBA superstar opened up a school for underprivileged children. First lady Melania Trump, in a statement, distanced herself from the broadside, which resembled a racial dog whistle, and praised James’ efforts. Flanked by signs that read “Promises Made” and “Promises Kept,” Trump dished up plenty of red meat to the sweaty crowd. Trump gave a full-throated endorsement to state Sen. Troy Balderson, who is facing Democrat Danny O’Connor, the Franklin County recorder, in Tuesday’s special election to fill a vacant U.S. House seat. He touted Balderson’s record on crime and immigration and claimed that O’Connor, if he won, would be a “puppet” of Nancy Pelosi, who stands to reclaim the title of speaker of the House if Democrats seize control of the body this fall. The Ohio rally was Trump’s third of the week and he has pledged to accelerate his pace further as the midterms approach. He traveled to the Columbus area from his golf course in Bedminster, New Jersey, where he is in the early stages of an 11-day vacation.